ASTRALCOM Launches Newly Designed Transport Solutions Website | ASTRALCOM - Content Strategy, Conversion Marketing and Customer Acquisition. (Lakewood, CA – November 7, 2017) – ASTRALCOM, LLC today announced that they had recently completed a new website redesign project for Transport Solutions, based in Long Beach, CA. Transport Solutions are experts at Freight Optimization Assessment, Freight Negotiation and Implementation, and Site Location and Landed Cost Studies. 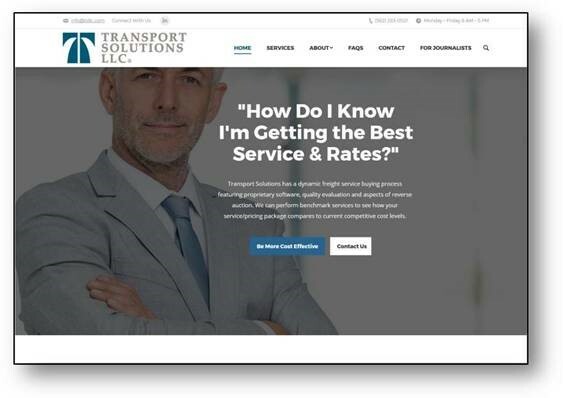 It was the goal of Transport Solutions to create a new website that effectively updated their online image, conveyed the professionalism, innovation, and credibility that Transport Solutions is known for industry-wide. Since ASTRALCOM created Transport Solutions’ very first website, they were honored to step-up to the challenge this time around, too. “Transport Solutions reached out to us to explore options in updating their online image,” said Richard Bergér, VP at ASTRALCOM. “So, our team worked closely with Transport Solutions in helping them to identify ways to create more meaningful engagement thru design and content that ultimately benefit both Transport Solutions and their clients,” he added. Transport Solutions’ new website is based on WordPress, is responsive to fit all viewing screens and includes several nuances designed to deliver key information points and calls-to-action sooner in the visitor experience. “Transport Solutions is very pleased with the upgraded website produced for us by ASTRALCOM’s team. The project was handled with skill, creatively, on schedule and within budget,” said Phil Ramsdale President at Transport Solutions. “Our nuts and bolts pieces were tied together with great conceptual linkage, including new ways to incorporate customer personas,” added Mr. Ramsdale. The newly launched website for Transport Solutions site is at www.tsllc.com. Keep up with the outcome of this project and learn more ASTRALCOM at www.astralcom.com.